The Cheltenham Festival is the meeting of the year in National Hunt racing in the UK and Ireland as the leading horses come together in their respective divisions, in many cases for the first time during the campaign. Ante-post markets open for all the leading races at the start of the season which allows punters to try and find some value before the meeting begins. Here are three horses in the early betting which can be backed to rule supreme at the Festival in March. My Tent or Yours has been one of the most consistent runners at the Cheltenham Festival over the last four years as he has finished second in all his four appearances at the meeting. In 2013, he had to settle for the runner-up spot behind Champagne Fever in the Supreme Novices’ Hurdle, while in each of the last three years he has been second in the Champion Hurdle. Nicky Henderson’s runner deserves his place in the winner’s enclosure at the meeting and there is every chance he could take advantage of what is arguably a weak renewal of the Champion Hurdle in March. The 11-year-old was successful at Prestbury Park recently in the Grade Two International Hurdle where he defeated The New One and Melon. At 14/1 in the betting for the feature race on the day of the meeting, he looks fantastic value to finally get a Festival success. Samcro looks to be one of the latest superstars set to emerge from Ireland as the novice hurdler has swept away all of his rivals so far this season in a faultless campaign. After his most recent victory in the Grade One Deloitte Novices’ Hurdle at Leopardstown, the six-year-old is sure to be popular in the Cheltenham 2018 Betting Tips page for the Ballymore Novices Hurdle where he is already the 15/8 favourite to give Gordon Elliott his first success. This novice contest at Cheltenham has been the race in which so many horses have made a name for themselves and then gone on to fantastic careers in the sport and it is hard to see anything stopping Samcro from justifying his favouritism in the betting. 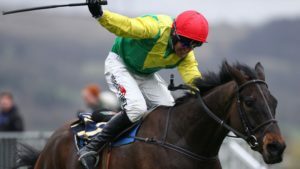 Cheltenham Gold Cup winner Sizing John is set to return to the Blue Riband event of the Festival in March despite a disappointing run in the Christmas Chase on his most recent start. Jessica Harrington’s runner dominated the 3m chase division in 2017, adding to the Irish Gold Cup and Punchestown Gold Cup to his victory at the Festival. If you put a line through the ten-year old’s last run, he has by far the best form going into the 3m2f contest on day four of the meeting. In his opening run of the new campaign, he prevailed by seven lengths in the John Durkan Memorial Chase at Punchestown. 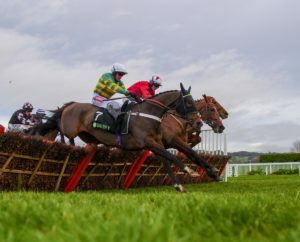 A return to Cheltenham will hopefully help the horse discover his form of last season and if that proves to be the case, he should be favoured at 7/1 to get the better of the likes of Might Bite and Coney Island. The 2018 Cheltenham Festival takes place this year from March 13-16. 100% matched first deposit bonus up to £/€50. £/€10 min deposit. 5 times wagering required prior to withdrawal. 18+, First deposits made via Skrill/Paysafecard/Neteller/Prepaid credit cards not eligible. Bonus code to be entered within 45 days. Wagering to be completed within 30 days of bonus code insertion. T&C's apply, Begambleaware.org. New UK & North Ireland customers. You must stake £10 or more at single/cumulative odds of Evens (2.0) or greater on your first bet. Free bet balance of £30 credited within 48 hours of your first bet being settled. Free Bets expire after 7 days. E-Wallet restrictions apply. Min. 5 game rounds. Game restrictions apply. Max. 30 Free Spins on selected games. Free Spins expire after 7 days. Full T&Cs apply.